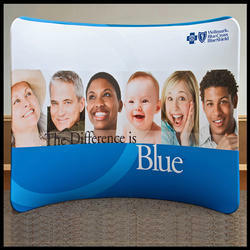 Big, bold 2-sided fabric graphic cover is seamless. Lightweight frame installs with ease. Fabric graphic cover simply slips over the frame and zips closed. Sturdy frame sets up in minutes without tools and is shock corded for easy assembly! Frame is painted silver to keep graphic cover clean. 10' (3 m) backwall hardware, graphic cover and three lights all fit in one hard-sided case with wheels! 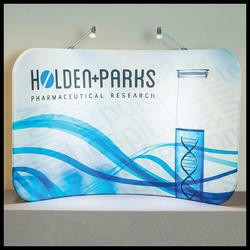 Looking for “Regatta Fabric Display”?